We offer dynamic re bounder, which is made of galvanized steel tubing and features a very durable heavy-duty net with elastic edging. It has an extremely stable design and three adjustable angle positions. 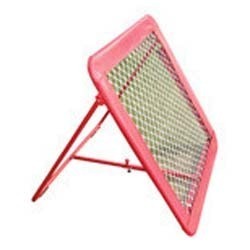 Our dynamic rebounders are available in perfect size for field practice or for the backyard. It comes complete with frame, net, hardware, lacing cord and anchors. - Made of Steel frame as well as G.I. Pipe with non-marking guards at the bottom & strong elastic. Available as Fixed and Adjustable. We are offering Pugg Goal 6 Footer Pair to our client. - Rebounder adjusts at different angles. - Fully collapsible steel construction design. - Size 1 Mtr x 1 Mtr. Description : Latest in the range for extensive rebound practices. with nylon netting set by bungee cords. - Latest in the range for extensive rebound practices. 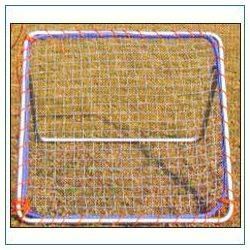 - Rebounder with 25mm round pipe with 1x1 mtr net.